Note: Other departure dates available including 29 April, 13 May, 20 May and 10 June 2019, prices do vary, please call Saga Holidays for details. See some of Croatia's highlights on this all-inclusive three-centre holiday, which combines a relaxing stay on Brac with stays on the Dalmatian Coast. You can discover more of this beautiful country on a range of excursions, taking you to charming historic towns, exploring spectacular scenery and offering an insight into the unique culture of Croatia. Day 1: UK-Split-Tucepi. 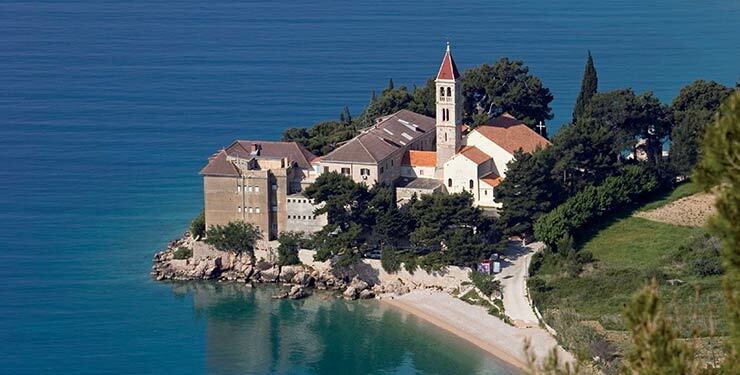 Fly to Split and travel to Tucepi, where you spend four nights at the locally rated 4-star Bluesun Hotel Alga. Days 2-4: Tucepi. Explore Omis and perhaps visit Dubrovnik on optional excursions. Day 5: Tucepi-Brac. Included tour of Split, then take the ferry to Brac where you stay seven nights at the locally rated 4-star Waterman Resorts Island of Brac. Days 6-11: Brac. Included tour of Brac, with the rest of the week at leisure. Optional tour of Brac’s villages, and wine tasting in Dol. Day 12: Brac-Solin. Travel to Split and along the coast to Solin. Stay three nights at the locally rated 5-star Hotel President. Days 13-14: Solin. Visit Salona and Trogir on included excursions while an optional trip visits Krka National Park and Sibenik. Day 15: Solin-Split-UK. Travel to Split airport for your return flight to the UK. optional travel insurance underwritten by Great Lakes Insurance SE, UK Branch and additional cancellation rights on overseas holidays for over 50s, or a price reduction if not required (cover to subject to medical questions). 2) Offer is only available on 22 April 2019. 3) All prices are £s per person based on two people sharing and may be limited to a number of bookings. 4) Flights are from Manchester to Split, on the scheduled services of easyJet or the charter services of Thomas Cook Airlines. 7) A reduction of £54 applies if you do not need the optional travel insurance and additional cancellation rights. 8) For single accommodation or to take advantage of our flight upgrade deals (subject to availability and extra charges may apply), please visit saga.co.uk/holidays or call for further details.